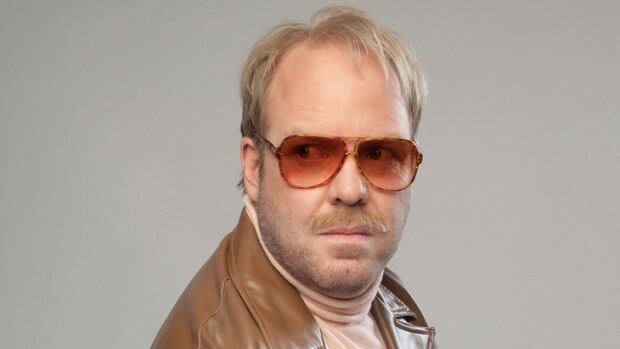 It’s always a risk to include in the name of your comedy show words that a potential reviewer could use as an apt description of that show, a risk Peter Helliar ran this year with Whatevs (…forevs). But far from generating apathy (or feeling interminable), Helliar’s crazy eyes, comedy nous and brash bravado combine for a satisfying, if not groundbreaking, night of laughs. On the other hand, ‘whatevs’ is a pretty good word to sum up the scattershot nature of the gig. Helliar happily lurches from the awesomeness of Costco, to Catholicism, to the humdrum ironies of married life, to toilet-related anecdotes, clearing ungainly segues in a single leap while laughing at the disconnects along the way. His impression of the Dalai Lama (think Michael Jackson on Valium), was a particular – and unwittingly disturbing – surprise, growing as it somehow did from musings on the judgement we get for using plastic bags at the supermarket checkout. It has to be said Helliar’s timing is superb, as you’d expect from someone who’s been around the traps since working with Rove (remember Rove?) back in 1998. He knows instinctively how far to push a joke, when to mould his rubber face into cherubic glee or appalled horror, when to let subtle mannerisms do the work for him. And while the material treads well worn paths of comedy (bewildered deconstruction of youth culture, observations on marriage and kids etc) the destination is always refreshing. The funny thing is I’d always been someone for whom ‘whatevs’ pretty much summed up my view of Peter Helliar. I could take him or leave him. How wrong, and happily wrong, I turned out to be.